After every 12 years Kumbh comes to Haridwar which drawns more than half a million people. The last Kumbh happened in year 1998 in which Sahaja Parivar of Haridwar organized an Exhibition during Mela. All the seekers of Truth who visited our stall were explained how Self-Realization can be achieved so effortlessly through Sahajayoga. The beneficial effects of Self-Realization and Sahajayoga in our life were also explained. Through pictures and posters the subtle system of our body was exhibited and various aspects of Sahaja Yoga were depicted. The importance of Seven CHAKRAS and 3 NADIS were explained to the visitors who came in large number. 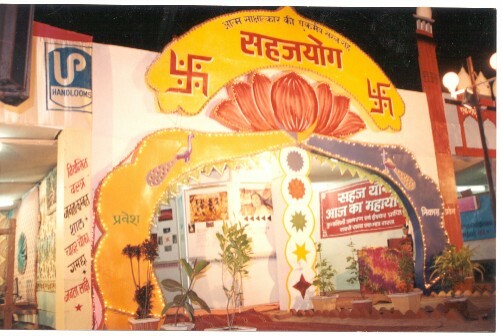 The beautifully decorated Sahajayoga stall was the center of attraction of the Kumbh Mela. Self-Realization programs were organized everyday through which thousands of seekers got the Self-Realization. The complete program lasted for 50 days and everybody felt the vibrations during the Kumbh Mela whoever visited the SahajaYoga Stall. The program concluded on 21st APRIL 1998 and an appreciation letter was given to Sahajayoga and its Stall by Gazetted Mela officer.